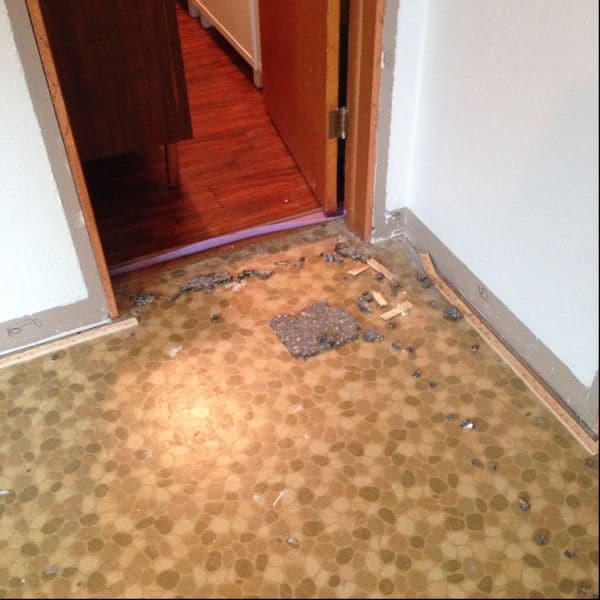 Until recently our 50’s ranch had a mix of carpet, original hardwood, and junky linoleum. After living with it for the last year we finally decided it was time to replace the flooring. 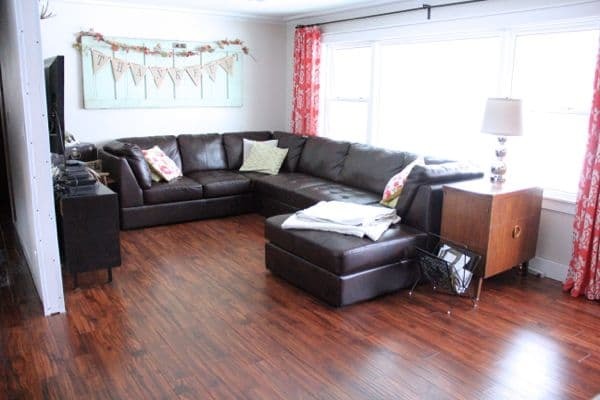 This was our 3rd house where we have re-done the flooring (and our 4th if you count a friend’s house we helped with), but I still learned a TON through this process. 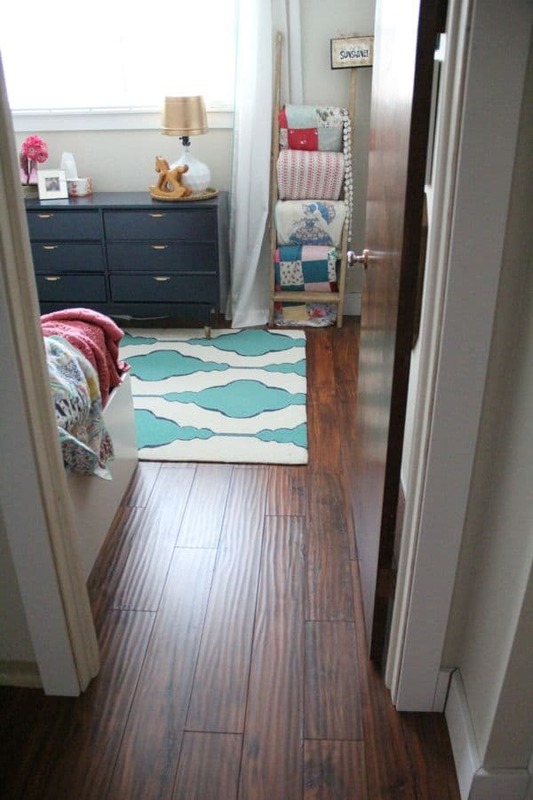 I couldn’t help but share these tips and tricks for laying laminate flooring! 1. Shop Around- Originally I got about 50 different samples from Lumber Liquidators, discountfloor.com, and efloors.com. Once the samples arrived I instantly knew which sample was “the one”. Everything was perfect until I realized it was $6.80 sq/ft!!! I was hoping to stay under $2.50 sq/ft so I was majorly disappointed. 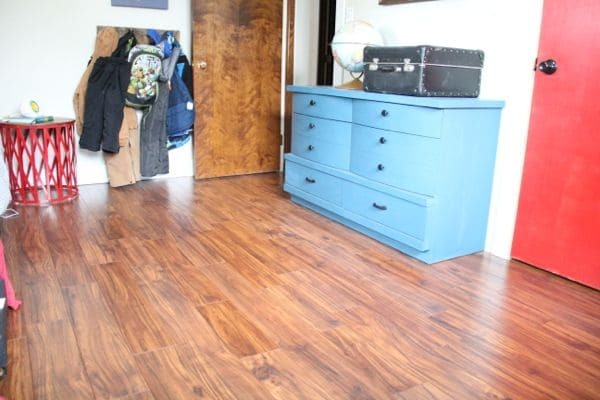 I ended up calling about 15 suppliers asking for a quote on that specific flooring until miraculously I found a company selling it for $2.85 sq/ft. 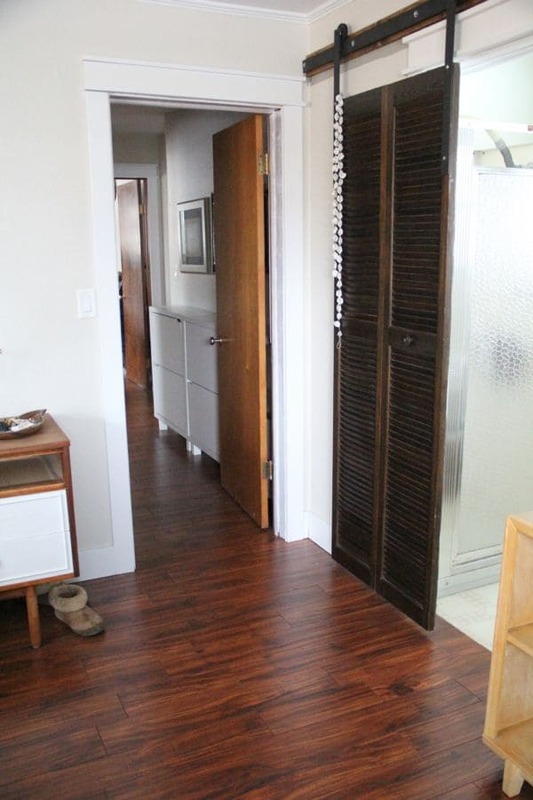 The EXACT SAME FLOORING! I immediately ordered it and never turned back. *This post contains some affiliate links* We went with Armstrong L0243 which is Armstrong Rustics Premium Laminate in Acacia Cayenne. Moral of the story- find what you love and then shop hard until you find it at a price you love. We ended up paying about $3,000 for the underlayment, flooring, and shipping. It took about 2 weeks from order to delivery and came on two big pallets they took up most of our 1 car garage. 2. 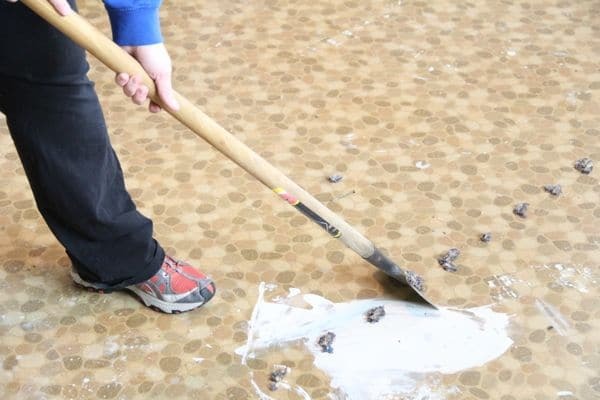 Ice Scraper- As we began to peel away the layers we found quite the variety of 50’s linoleum. 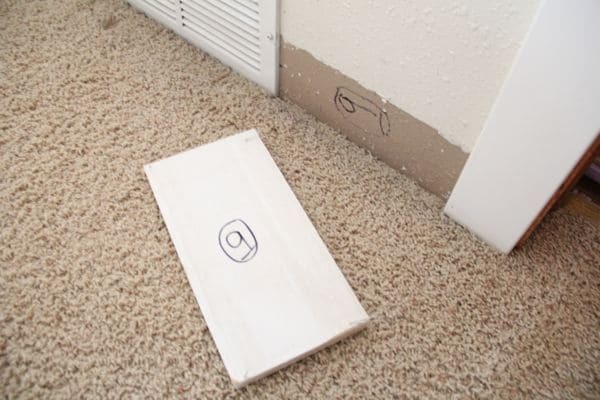 It was covered in staples that have held down years and layers of carpet pad. Thankfully our friend Jake was helping us and taught us the EASIEST trick ever for removing staples. It actually was such a life changing trick that I made a video… in all my DIY’ing glory. I hate it so much that I can’t believe I’m sharing it with you, but I think it makes more sense when you see it. Or ignore it and I’ll explain here. Basically just get a lawn edger (or ice scraper, depending on what you call it), and use it to just push the staples out. If I would have known this sooner I could have saved DAYS on my knees pulling staples out with pliers at our old houses. 3. Label Trim– We started out writing WAY too much info on the back of our trim pieces to remember where to put them back. Then again, Jake taught us to just number each piece, as well as number the base of the wall where the coordinating piece belongs. So simple, but so important! That way you’re not left with hundred’s of pieces trying to figure out where they all belong. 4. Unfinished Edges– BE GENTLE with them. 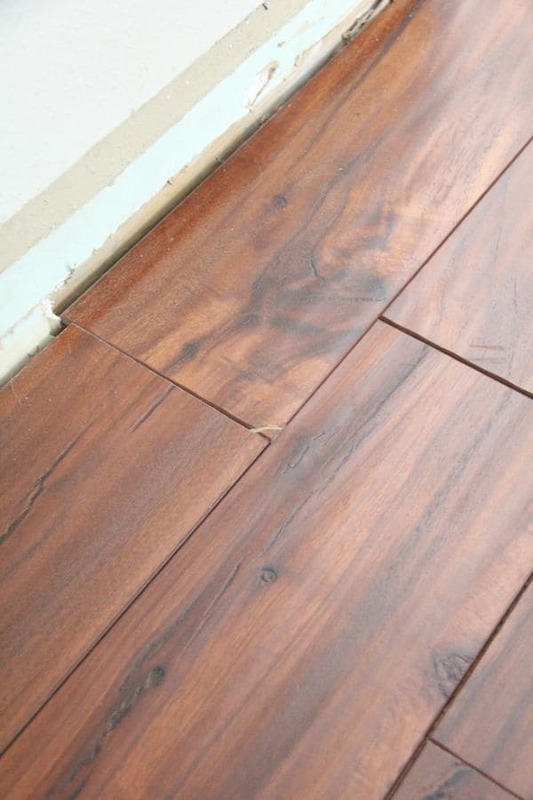 Because laying the flooring is a few day process, you will have exposed edges. This means they are not supported and will snap easily. I made the mistake of rolling a heavy piece of furniture across an unfinished edge (even with cardboard below it), and snapped a corner off. It was too hard to get that piece of flooring out to replace it, so we ended up gluing down the broken piece and I will be coloring it with a wood marker. Don’t do like I do. 5. Plan– Without handling the flooring this is hard to understand, but the flooring only lays one way- from left to right and bottom to top, or right to left top to bottom. Once you start you can’t work backwards (which happened to us), so you have to start in either extreme corner of your house. 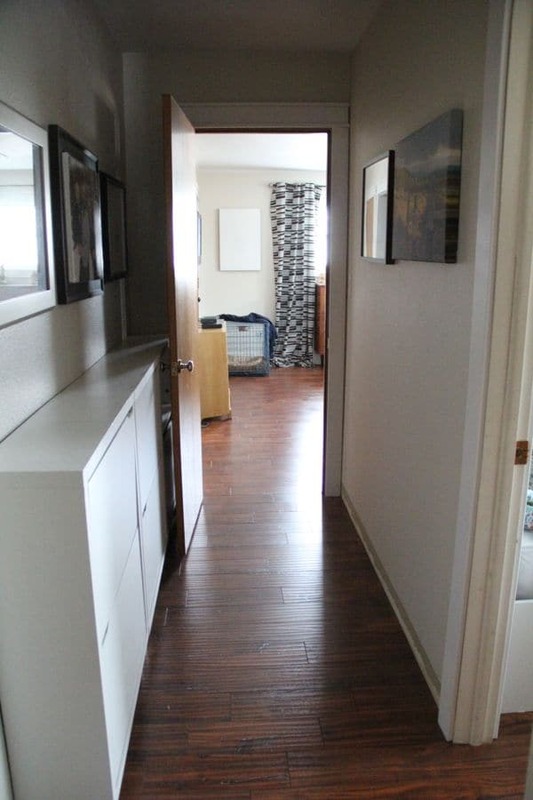 In our case we started in the middle (the living room) leaving us with a hallway to lace the flooring into. We couldn’t keep going down the hallway because of the direction the floor lays. It’s complicated, but if you lay your own flooring please trust me! If you make our mistake we ended up having to cut off the “tongue” and lace the floor in without it locking in place due to the missing tongue. A few days before Thanksgiving we laid our last piece of flooring and couldn’t be more thankful to be finished with this project! All together we laid 1100 sq/ft of flooring and it took us 4 days with anywhere from 1-4 people at a time. I LOVE how it has a “hand scraped” look, even though it is just a photographic image on a piece of laminate flooring. 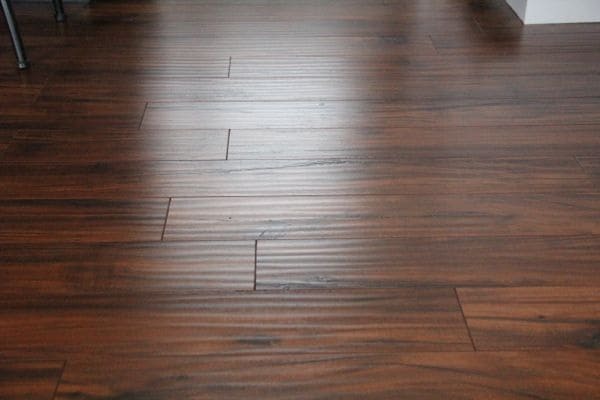 We chose laminate because of how durable it is with little kids and a dog, but I am REALLY happy with how natural it looks. Yes these photos are “un-staged” for your viewing pleasure! 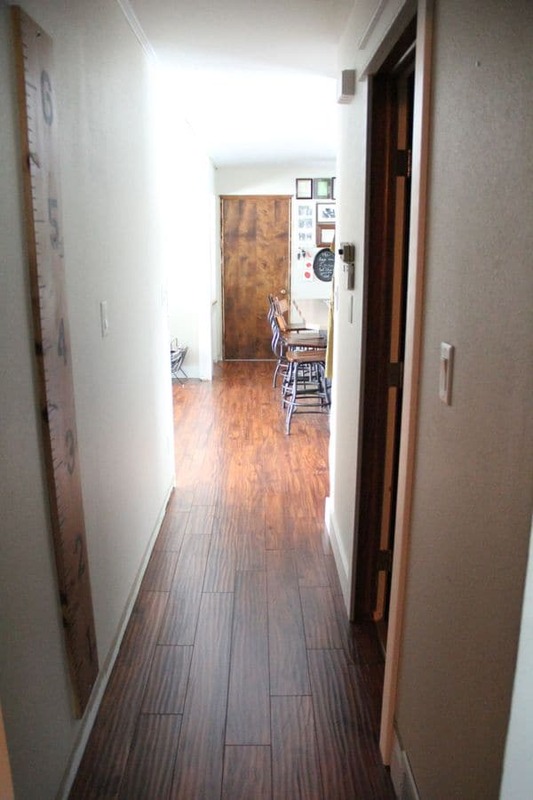 This way you can see how the flooring flows through the house. So if you’re in the market for new flooring you’ve heard my two cents. 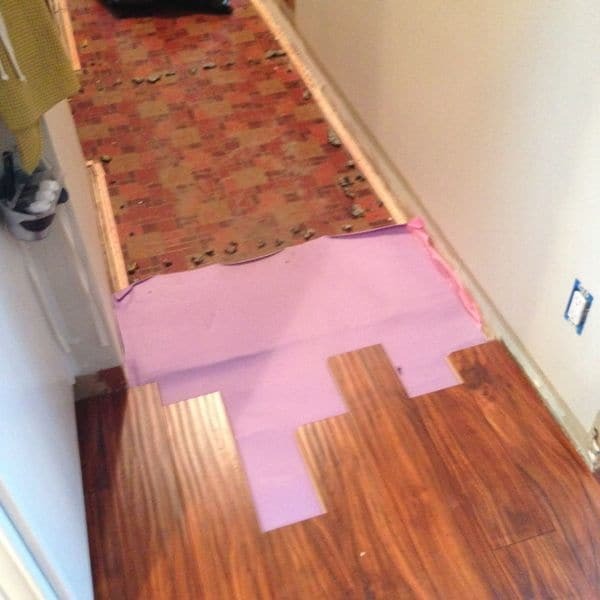 Have you ever laid lock-n-click flooring? Do you have any expert tips I missed? « DIY Kid’s Play Platform & Jumping Stumps! Any tips on removing carpet tack boards? We just use a hammer and pry-bar. Oh and gloves for picking them up! That part is not fun.